The first chapter in this second volume introduces my vision of the ageing process in the midface and its surgical treatment. Many of the theories are similar to those of Giovanni, even with slight “differentiating traits”. One of the aims of this chapter, therefore is to show a different point of view on anti-ageing surgical treatment of the midface, i.e., the use of malar implants. - Why undermine the platysma? Indeed, twenty years of work with malar implants has given me a great advantage in dealing with this technique and the rare complications that can arise. My fervent opinion is that the application of implants is extremely helpful and gives generous results in rejuvenation of the midface. In the past few years many papers have been published which implicate the loss of volume in these areas as being the fundamental cause of ageing. From this we can deduce that the addition of external volume, besides fat grafting, can in many cases represent an optimal solution for this problem. 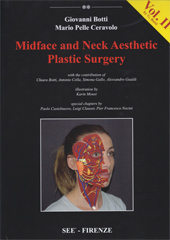 The second topic dealt with in this text is the surgical treatment of the neck. I have preferred to present this chapter by first analyzing all the structures of the neck, starting from the external layers and working inwards, explaining with clarity the various treatment options for each layer depending on its depth. The text explains the procedures to associate with the various situations to obtain the best results. I have described both the simpler techniques and the more complex ones with the premise of obtaining the best results possible, sometimes with a particularly non-conservative procedure. More than the surgical aggressiveness, this approach is often driven by the desire to obtain the best result possible in this challenging area.